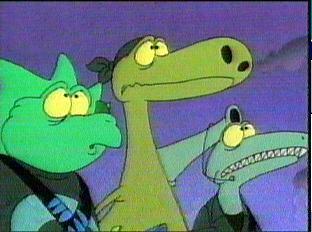 After the Eek show had been running succesfully for about a year or so, suddenly a new cartoon showed up: the Terrible Thunderlizards , also written by Bill Kopp and Savage Steve Holland. This cartoon was initially meant to be broadcasted together with the Eek episodes from the start, but it turned out that the animators had given one of the main characters the wrong color, which meant that all episodes had to be re-done. Therefore, the TTL only showed up after a year or so. The diplodocus Bo Diddley Squat is extremely stupid, even for a dinosaur, and he is single- handedly responsible for screwing up most of the Thunderlizards' plans. A fine example of his stupitidy would be when the TTL's are trying to save supplies from their crashed and soon-to-explode plane: while Doc and Kutter salvage useful things like food and weapons, Squat saves things like inflatable pool animals and rubber bands. Because of his unmatched stupitidy, Squat is also the team member that is always picked as the 'volunteer' whenever some dangerous operation needs to be carried out. 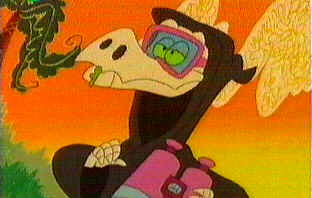 The third member of the Terrible Thunderlizards is the Triceratops Day Z. Kutter. In terms of stupidity, Kutter falls somewhere in the middle when compared to Doc and Squat. He is also the dinosaur that usually comments on Squat when the latter screws up again. His sentence Well yeah, that would fit nicely into the bad things category is one of the best of the entire Eek and TTL shows. 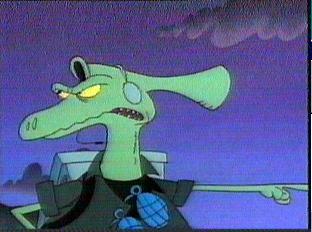 General Galapagos is the somewhat badly-tempered military commander in charge of the Terrible Thunderlizards. Why he actually employs them is somewhat of a mystery, as he clearly doesn't believe they're up to the task of eradicating the dangerous humans Bill and Scooter. His doubts about the capabilities of the Thunderlizards seem to be well-founded, as they generally end up doing more damage to the dinosaur's habitat Jurassic City then to the aforementioned humans. The Thunderlizards also regularly invade the general's private life, which is of course a Bad Thing®. General Galagos is also well-known for predicting the extinction of the dinosaur race. Because the Thunderlizards screw up a lot, the general sometimes sends them some help in the form of Mr. T-Rex or, less frequently, El Gordo or Nate the Dragon. Of course, these efforts don't really matter as the Thunderlizards will screw up no matter what. The other half of the human world population is the exact opposite of Scooter. Whereas the latter is happy and cheerful, Bill is constantly complaining and whining about everything. Of course, he has every reason to, because he is usually the guinea-pig for all of Scooter's insane inventions and experiments gone wrong. These experiments usually cause huge amounts of pain and suffering to Bill, who is probably the most unlucky character in all the Eek and TTL episodes. On more then one occassion we can hear Bill make remarks like : When does the Hurting stop or Make the Hurting stop. As if the constants tortures at the hands of Scooter's inventions aren't enough already, Bill is also the favourite snack of the Jungle Slug (sluggus idiotus), one of the most perilous and definitely the most silly-looking creature ever to wander the face of the earth. Not much is known about the jungle slug (Sluggus idiotus), but what little information we have about this dangerous creature seems to suggest that is preys solely on the human being known as Bill, and in particularly on Bill's brain (or lack thereof). Considering there is only one Bill, it's rather surprising that the Jungle Slug species hasn't become extinct yet. 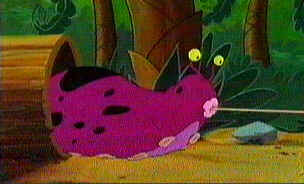 Regardless, the Jungle Slug is extremely dangerous and should be avoided at all costs. Mr. T-Rex is military specialist (no, really) that has been known to help out the Terrible Thunderlizards on occasion, although they do not always seem to appreciate his help. 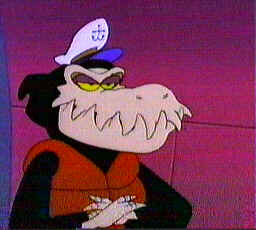 Mr T-Rex is a very obvious rip-off from the eighties TV show, the A-Team. It's even so obvious that the real Mr. T., who played the part of B.A. Baracus is that show, actually did the voice-overs for Mr T-Rex. Like his counterpart in the A-Team series, Mr. T-Rex is not to be fooled with. His favourite quote is I pity the fool. However, his tough-guy attitude doesn't really help him, as he gets hurt as much as any other character in the TTL series. His most memorable scene in the series involves him being eaten by carnivorous plants, for example. The Thugosaurs are the evil villains that live in the X-Zone (wilderness), from where they constantly unleash plans to destroy the 'civilized' dinosaurs living in Jurassic City. 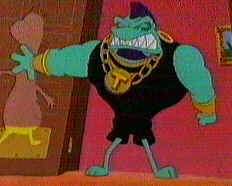 The leader of the thugosaurs is the infamous Thugo. On top of being rather diabolic, Thugo is also quite vain, and a considerable amount of Thugosaur manpower is used up to keep him looking nice and shiny. This of course undermines their plans to wipe out Jurassic City.